A significant indication to the reputation enjoyed by our firm is the trust that our clients have placed with us for thirty years ! 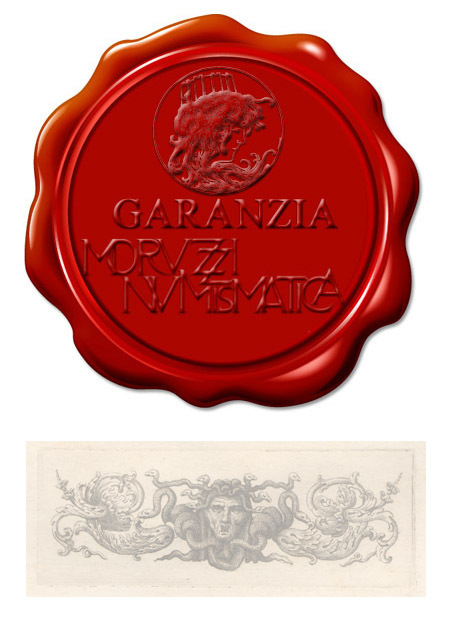 Most significantly we offer a formal guarantee for every numismatic item that we sell: the MORUZZI NUMISMATICA GUARANTEE. The law foresees, as stated in article 64 of Legislative Decree 22 January 2004, no. 42, 'Code for cultural goods and the landscape' (*), that buyers should be issued with a certificate of guarantee and provenance. MORUZZI NUMISMATICA does not limit itself to this; it gives an unlimited guarantee for coins and banknotes not only of authenticity but for all the features indicated on the accompanying descriptive ticket. For the authenticity of coins the Moruzzi Numismatica Guarantee does not expire, it is also valid for accurate cataloguing and above all exact grade of preservation. (*) Whoever sells to the public, exhibits with a view to sell or is an intermediary for the sale of paintings, sculpture, graphics or antiques of historic or archaeological interest, is obliged to provide the buyer with documentation of authenticity or at least a probable attribution and provenance; or else, if these are missing, to issue documentation, in accordance with the legal and regulatory procedure, a declaration with all available information with regard to the authenticity or probable attribution and provenance. Such a declaration, when possible, due to the nature of the object, should be attached to an image of the same.